As part of the group that helps develop ideas for EDAX products, it is always exciting and rewarding when those ideas become features within our software that our customers can use for microstructural characterization. This month, we have announced a new feature named PRIAS, or Pattern Region of Interest Analysis System. This is a feature that is near and dear to my heart, as we have been discussing it and developing it internally for a number of years. It wasn’t until recently when our Hikari XP camera became fast enough to support it that we felt that we could release this feature with its full characterization potential. In this blog post, I want to introduce PRIAS, and show some of its exciting new capabilities. Two of the most common OIM map types are the image quality map and IPF orientation map. 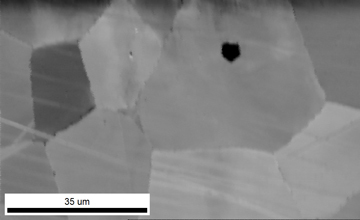 Examples of these from an Inconel 600 nickel-based superalloy are shown below. 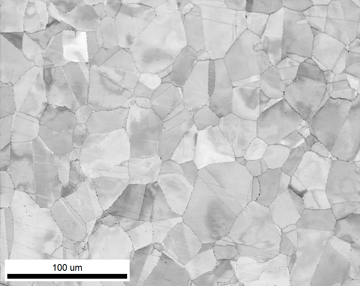 These images are common in part because they show a nice, high-contrast visualization of the microstructure, and communicate information about grain size and shape easily. 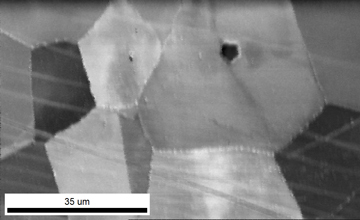 Generally traditional SEM imaging with Secondary Electron (SE) or Backscatter Electron (BSE) detectors with EBSD samples does not provide great contrast or images because of the sample preparation requirements, the sample tilt requirements, and the detector geometry relative to the specimen. Often on a well-polished surface, users hope for a small piece of dust to help facilitate focusing. The traditional remedy for this problem has been a Forward Scatter Detector, which is a solid-state diode typically positioned around the bottom of the phosphor screen. While it would be possible to implement multiple FSD diodes (as some other EBSD vendors have done), each diode requires amplification and analog-to-digital conversion circuitry, which effectively limit the maximum number of diodes that can be used. 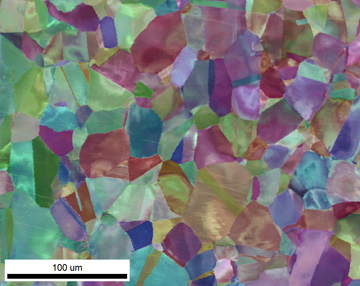 The PRIAS approach is an innovative method to use the EBSD camera and phosphor screen synergistically as both an EBSD pattern collection detector and an array of positional electron detectors. In the PRIAS mode, region of interest (ROI) electron detection areas are defined on the EBSD phosphor screen and the average intensity is measured for each ROI as the electron beam is rastered over the area of interest. The intensity variations for the various ROIs can then be used to create gray scale or colored micrographs showing orientation, atomic number, and topographic contrast. PRIAS Live is a traditional imaging technique. In this mode, the Hikari XP camera is highly binned to produce very fast frame rates which enable acceptable imaging speeds. With PRIAS Live, 25 ROIs are pre-defined as electron detector regions. 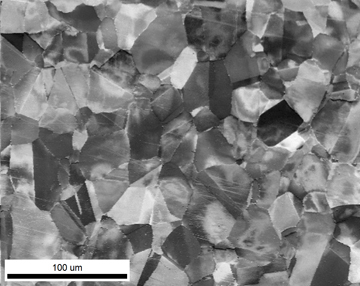 The array of PRIAS live images collected from the same Inconel 600 sample is shown below. The second mode, PRIAS Collection, runs simultaneously with standard OIM mapping. In this mode, 3 ROIs are pre-defined and these imaging channels are stored with the collection orientation data. These 3 signals can then be mapped in OIM Analysis. 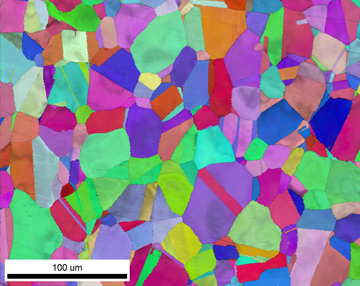 The third mode, PRIAS Analysis, requires saving EBSD patterns during OIM mapping but offers the most flexibility in post-processing analysis. In this mode, users can position and size the different ROIs to be imaged, as well as perform background and dynamic background corrections to the saved patterns. If the same or similar ROIs are selected, each mode produces similar images as shown below. The advantage of the PRIAS Live mode is that qualitative microstructural imaging can be obtained in a much shorter time period than standard OIM mapping. PRIAS images can also be collected at high speeds at lower voltage and current conditions. 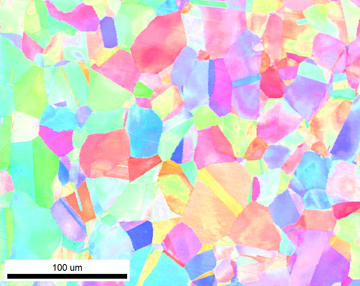 This might lead to interesting applications in characterizing materials like plastics and glasses that are not typically associated with EBSD work. These are areas we are currently investigating. For both the PRIAS Live and PRIAS Analysis modes, an array of up to 25 images is available for further processing. This processing includes weighted arithmetic operations and RGB coloring of multiple ROI signals. 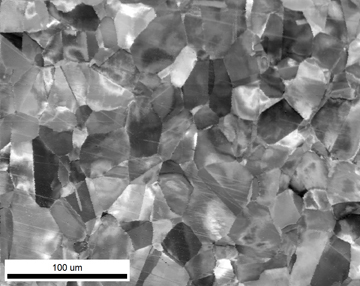 In the image below, RGB coloring was used with 13 ROIs to produce an image showing both grain contrast as well as deformation contrast within the grains. While the coloring cannot be used for quantitative orientation analysis, as is typical for IPF Orientation maps, the image does provide good visualization of the underlying microstructure in a matter of minutes. PRIAS images of combined gray scale and colored contrasts can also be generated, similar to combined image quality and orientation maps. This image can often highlight interesting structural features for further analysis as shown below. 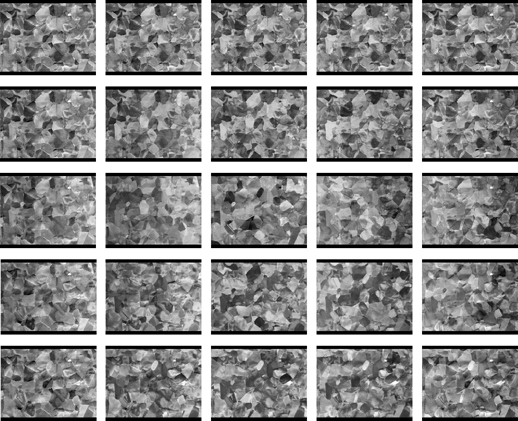 To this point these examples have focused on orientation contrast to generate the PRIAS images. 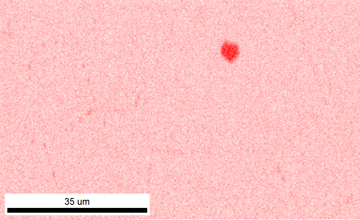 However, PRIAS imaging can also provide atomic number and topographic contrast information. 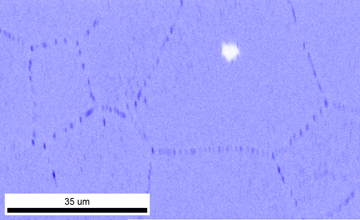 From the same Inconel 600 sample at a higher magnification, EDS elemental maps of Chromium and Carbon are shown below. 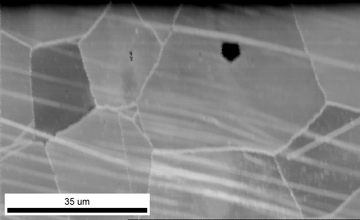 The images show the position of a larger carbide precipitate within a grain and numerous Cr-rich carbides decorating the grain boundaries. 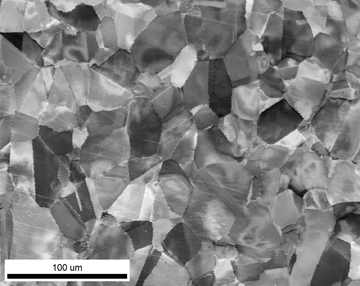 A PRIAS image generated from a single selected ROI shows strong atomic number contrast highlighting the position of the larger carbide phase. Selecting 4 ROIs maintains atomic number contrasts while adding more grain boundary contrast. 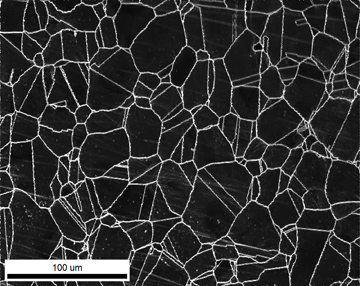 Selecting 2 ROIs localizes the topographic grain boundary contrast at the precipitates. With the ability to select and manipulate up to 25 ROIs, PRIAS provides great power and flexibility to image specific microstructural components. PRIAS images can also be compared and differences determined. As shown below, these differences correspond to grain boundaries within the material. 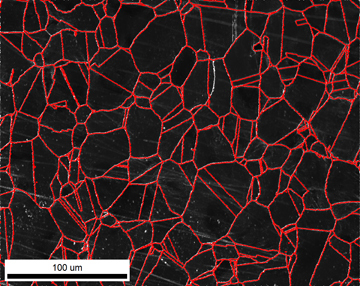 I hope I have shown some of the interesting capabilities of PRIAS imaging for faster visualization of microstructures. Certainly, since it has been introduced to our EDAX applications team, we have found it to be a very fun and addictive tool to experiment with. I certainly would not be surprised if future blog posts highlight using this functionality on a wide range of materials.